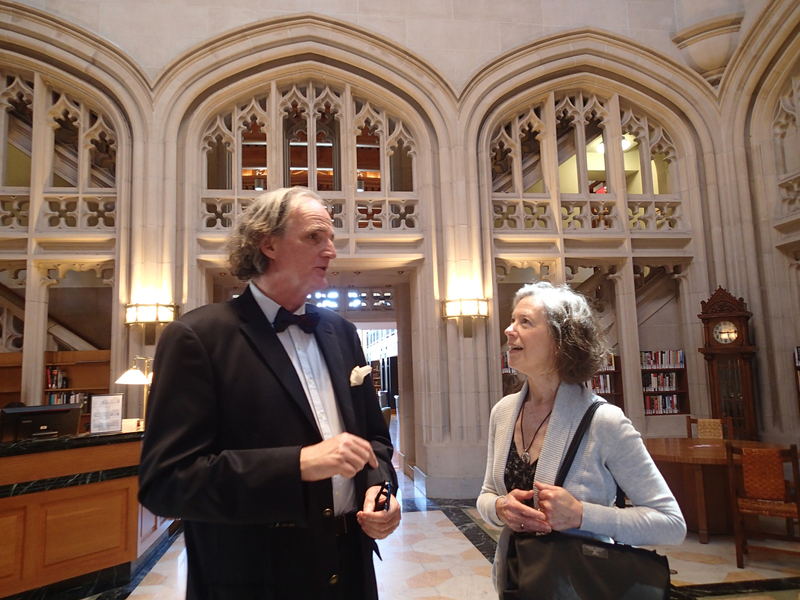 The program is hosted by Thomas Hill, Art Librarian of Vassar College. It is an exceptional weekly interview program with scholars and librarians about books, ideas, and the formation and circulation of knowledge. It can be heard on WVKR FM 91.3 on Wednesday afternoons between 12:00 Noon and 1:00 p.m. ET (17.00-18.00 GMT) during the academic year. 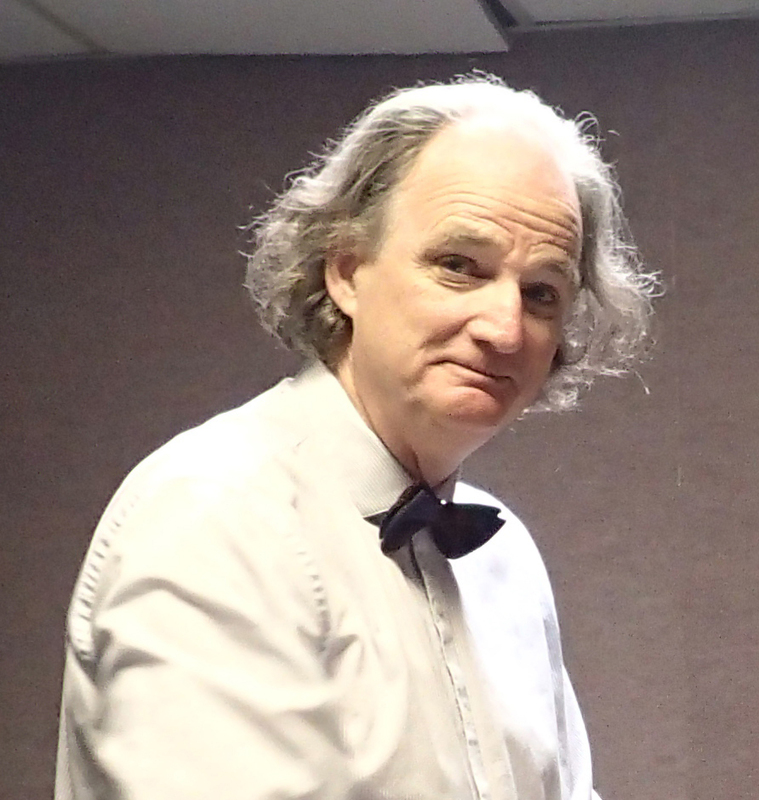 Tune in to WVKR at noon Wednesdays at 91.3 FM, or listen on the web through our website: http://library-cafe.org, where you will also find podcasts of past episodes and a listing of future interviews as they are scheduled. Here is what the recording studio looks like, upstairs within Main Building. With its Host, of course. In the Studio. Photograph by Mildred Budny. That building has changed in many ways (of course) since my undergraduate years. 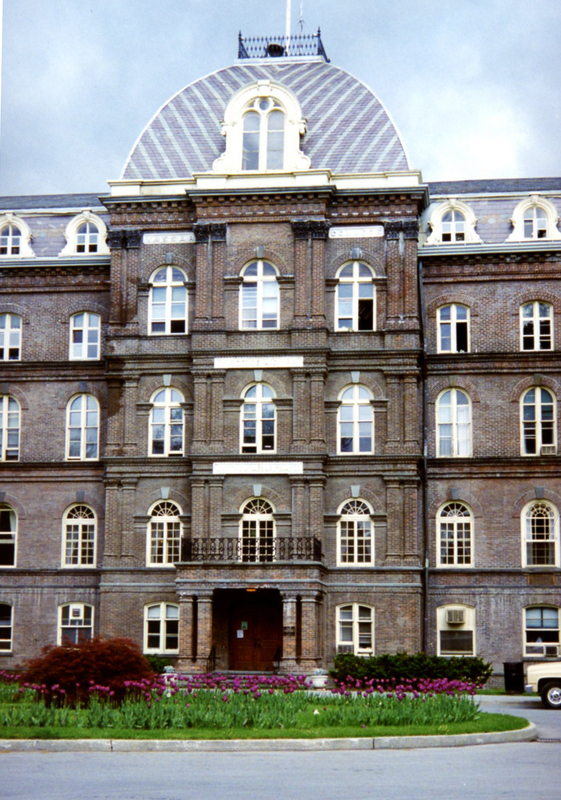 In Senior Year, after moving to Main, as the Seniors did then, my dorm rooms (2 rooms shared with a room-mate) were positioned on the second floor at a back corner, with windows overlooking 2 directions. I loved that place. That the room mate departed for weeks on end, or more, meant that I could enjoy alone expansively its space and views (with the obligations of feeding and giving daily medications to her large and lovely, aged cat, the remaining occupant). Worth saying that I also loved the rooms on the ground floor wing during my first undergraduate years in Jewett. Because there have been occasions over the years to revisit the campus, firstly to present lectures or seminars (starting in May 1974, at the invitation of one of my teachers, Julia McGrew), and more recently — since returning to live in the United States in 1994 — regularly to attend class reunions, or to present a talk or class (for example, in November 2003) — I have been able to observe the changes to the building itself. So the differences are in some sense already familiar, but the radio studio was new to me. Nice to be there with the Master at the Controls, on a clear, sunny, balmy day in May 2016. I am a librarian and medievalist interested in technologies of mind and memory. I hold a Ph.D. in English from Columbia University with a specialization in medieval literature, and my scholarship concerns the reading of courtly romance in the context of scholastic philosophy and psychology. My book, “She, this in blak”: Vision, Truth, and Will in Geoffrey Chaucer’s Troilus and Criseyde, was published in 2006. At present I am working on a book of essays entitled The Automaton in the Archive: Post-human Memories. 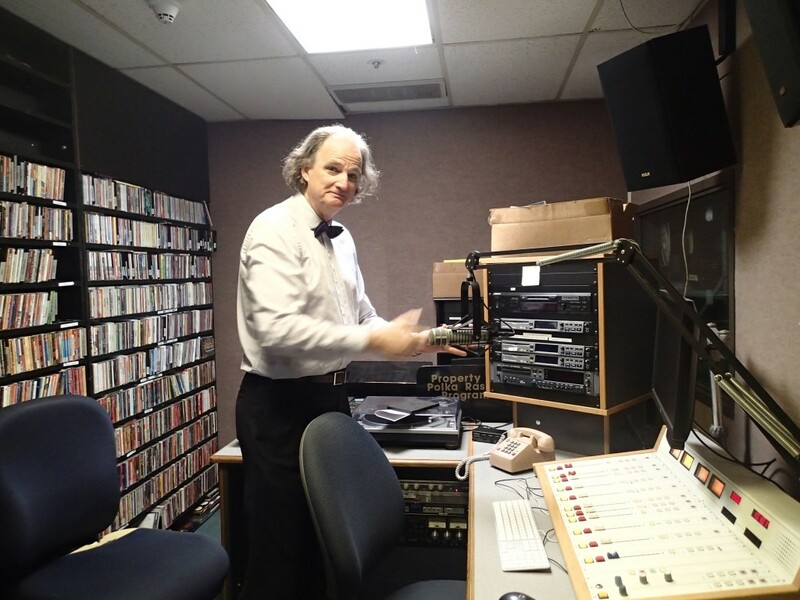 I also host “The Library Café,” a weekly radio interview program aired on WVKR, about scholarship, libraries, and the formation and circulation of knowledge. 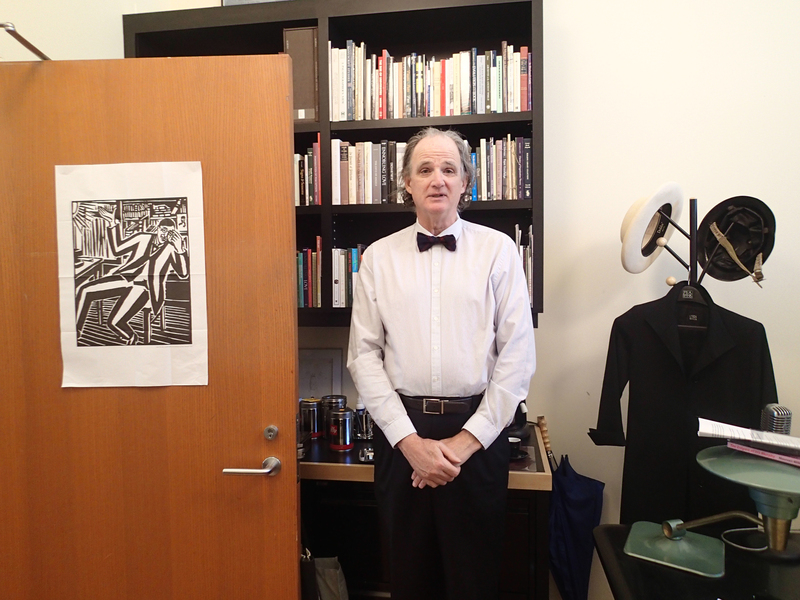 With impeccable style, as always, bot tie included (we like bow ties, as already noted here), the Art Librarian greets us at the entrance to his Office. There is the welcoming sense that every detail has been considered and chosen with care, good care. Superb. It is a pleasure to enter this Space. Behind the door are set out the materials and equipment appropriate to a well-appointed Café. A bonus is that it resides among the offices on the second floor of the Art Library, with tall ceilings and clear natural light. In Tom’s Café nook, choices await there for most tastes, Expresso and Amaretto included. Invited to the selections, I chose Expresso, always a favorite. Served with style and grace. The International Style reigns. Happily. Host as Barista. Photography by Mildred Budny. So happily strange, and wonderful, to find the offering in this special place, a Library building which I remember well from years as an undergraduate (as both devotedly a student and steadily a part-time student worker, which occupations can merge, not just overlap) and occasional years afterward. 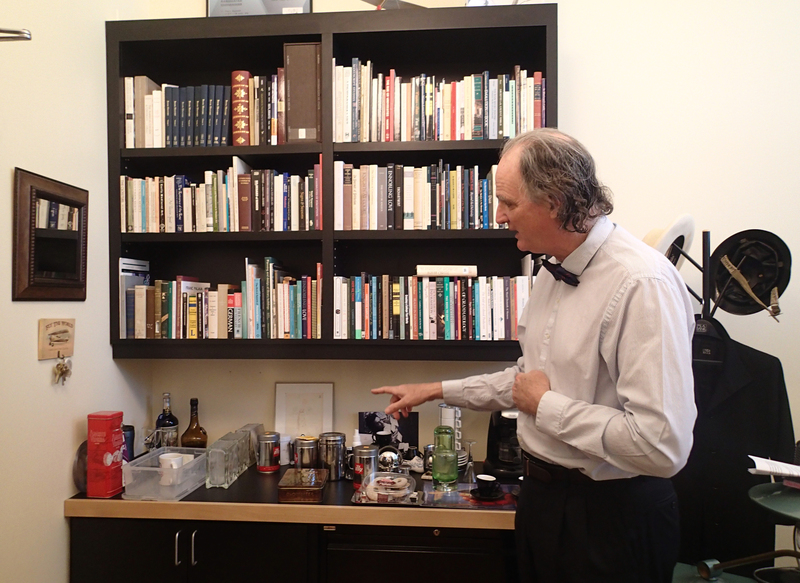 To visit the College, a special and favorite place, I have enjoyed occasional invitations to lecture. Since returning from England to live in the United States, I also respond to the standard reunion rhythm of every 5 years per class. 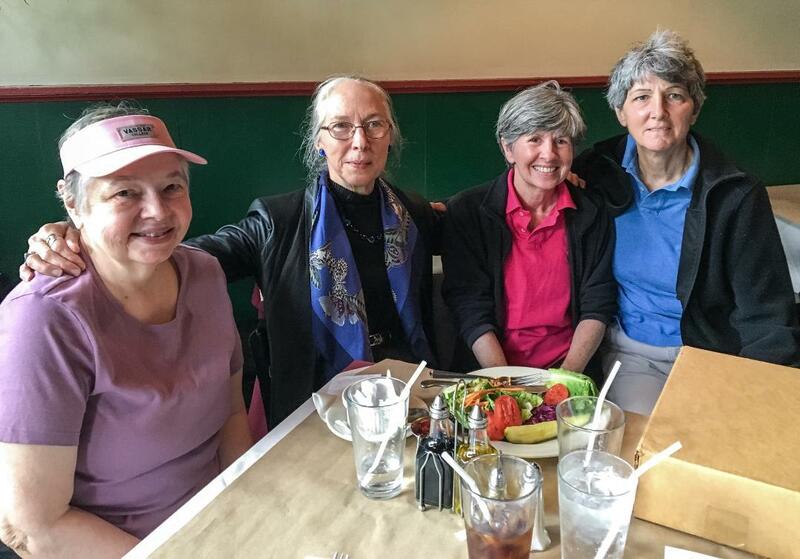 This year, a new sort of occasion arose, with the combination of a reunion and the invitations both to join a Meet & Greet event for alum authors (see below) and to visit Thomas Hill and his Library Café. The Library Café did not exist when I studied at Vassar. The visit to it now reminded me of the chance, returning after some years of visiting the Biblioteca Apostolica Vaticana for research, to discover that, at last, and unexpectedly, its rooms now had a café to which it was possible, with little loss of time to search swift sustenance out-and-about elsewhere, to repair for a quick expresso (which would be expressissimo) in the midst of deep researches in the august reading room. Speaking of that library in the Vatican City, well do I remember its cool, light-colored walls and wooden banks of reading desks, at which lay, at my bidding, such bookish treasures as the 11th-century Psalter of Bury Saint Edmunds and the 8th-century Barbarini Gospels (I remember it differently than that article describes), as well as other marvels, not forgetting a volume with annotations in handwriting attributable to Saint Dunstan himself. A bookish kind of saint, with a penchant for writing in books (I wrote about the traces of that penchant, forensic examination included). Hopefully they weren’t library books, but rather his own. That that Vatican Library café moreover had an early mosaic as part of its apse decor was a bonus, of course. 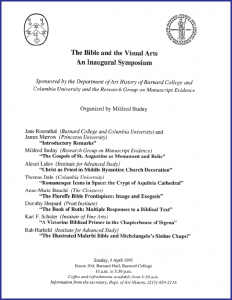 Traversing the centuries in a single span, that’s what we might do when we devote our attention to the close study of manuscripts and other written records across the centuries. Tangible reminders of those past centuries, they can enhance the experience. Shame when they are dislocated from their original settings, but that’s another story. 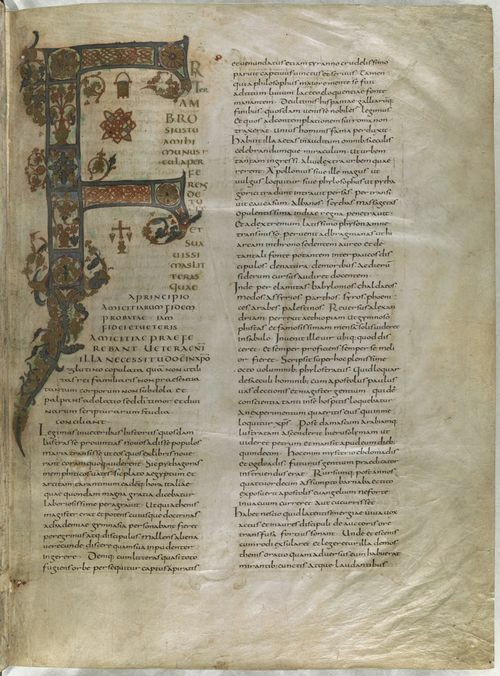 Some of our blogposts (“Manuscript Studies”) about dismembered and dispersed manuscript fragments tell about those matters, and about efforts to pick up the pieces. Always on the lookout for a suitable ” ‘Foundling Hospital’ for Manuscript Fragments”. Foster Homes or Forever Homes wanted for those Waifs & Strays. 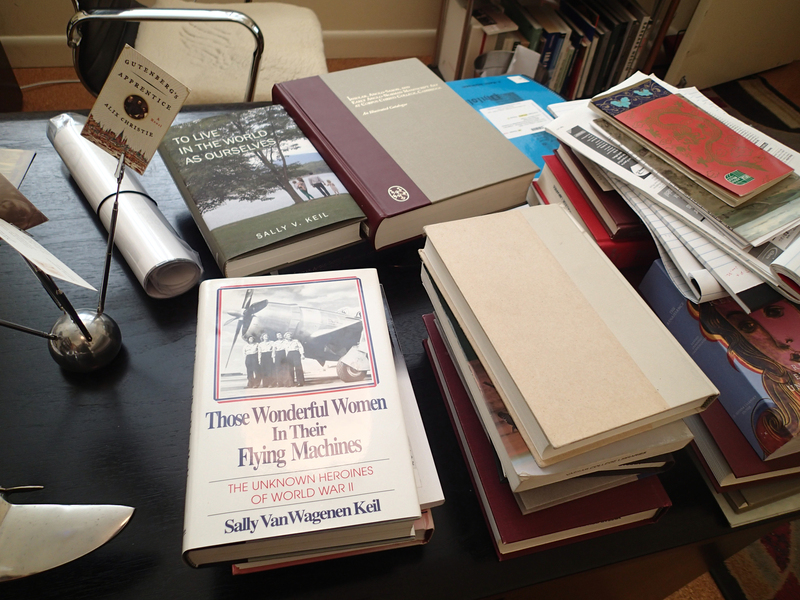 Among the gathered volumes, front and center, top and bottom, is a set by Sally V. Keil. Tom introduced us at lunch on the day of my interview. We had begun the recording, realized that there was more to say, but that lunch beckoned, by prior appointment, and decided to resume the recording after lunch. A treat to meet her and to begin to learn about her many interests. Her interview for the Library Café is now online here. 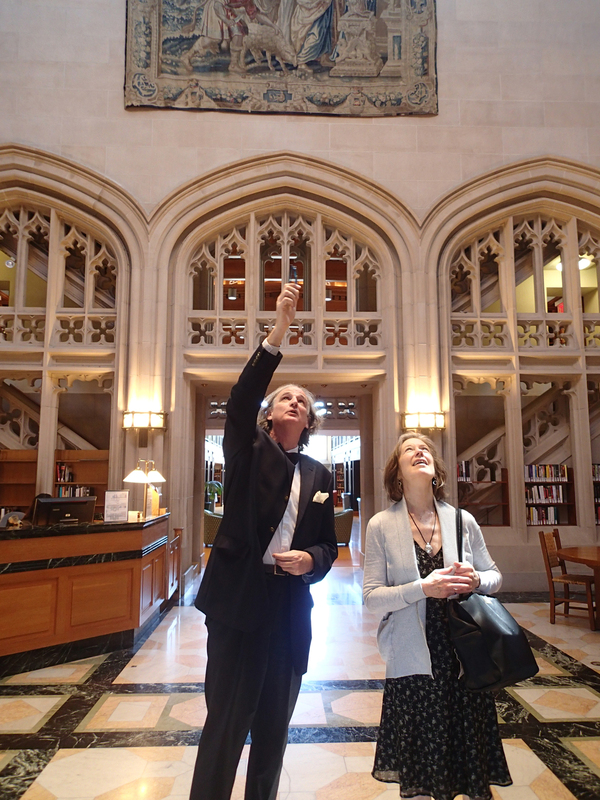 As we returned from lunch for the second installment of my interview in the recording studio, Tom gave a guided tour of some highlights of the main Library, including the set of 17th-century Belgian tapestries elevated grandly in position above the entrance hall. Wholly appropriate to have an erudite and entertaining account spoken by a dedicated Art Librarian. The bright light added to the sense of illumination across several planes. Tom sent a list of suggested questions ahead of time, to start the conversation and begin to think about subjects and approaches. Here is how his list started, out of some twenty-plus questions. 1. First off, can you tell us about your background you’re a Vassar graduate? 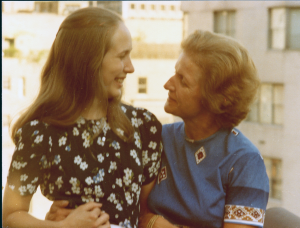 Were there Vassar professors or fellow students who had a formative influence on you? 2. Can you tell us generally about your career as a researcher since you left Vassar? 3. Can you tell us about the Research Group on Manuscript Evidence about its mission, history, and structure? You can hear the Interview as it unfolds, with the living voices in conversation in the broadcast. As a companion Guide to the radio interview, here is a Brief “Glossary” or “Index” for some People, Places, Libraries, Books, and Manuscripts mentioned there. 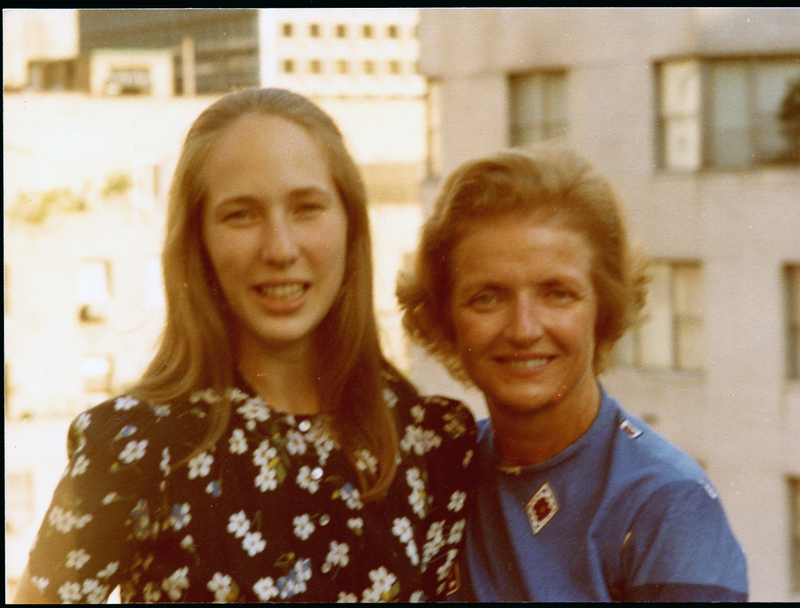 Not every household might be familiar with all Household Names. With this awareness — especially where multiple interests are engaged — I offer a few cues, with links, to the identities. Some illustrations included. I was one of the early Maguire Fellows, meeting Helen at lunch at The Savoy in London in the spring of that Fellowship Year, as described in the interview. We became friends. She was a remarkable woman, far-sighted and internationally visionary. Some souvenirs of Helen, recalled here with affection. Photographs of her at home in New York City. 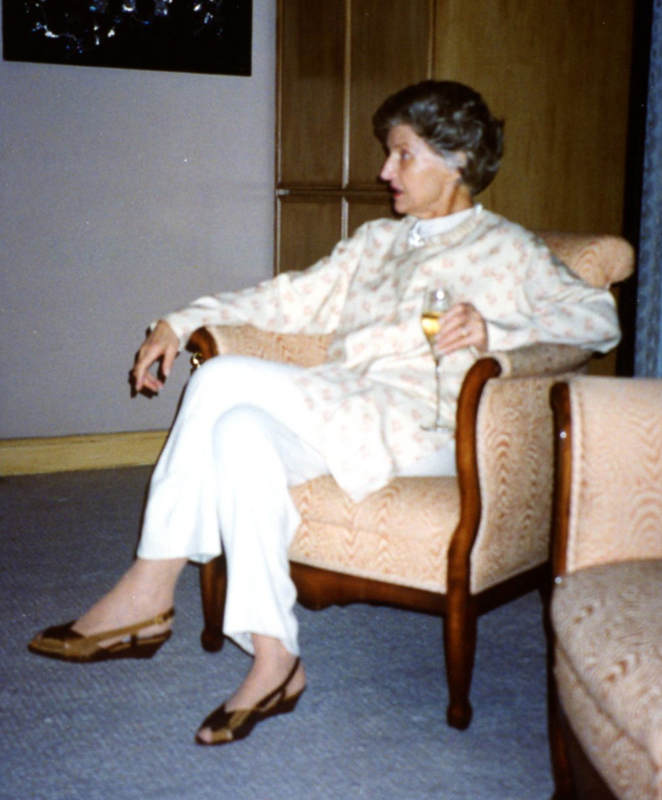 Helen Müller listens at home in NYC in May 1994. Photograph © Mildred Budny. 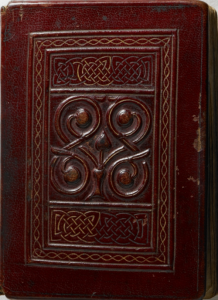 Commentary Volume for the ‘Codex Lindisfarnensis’ Facsimile (1960). Private Collection. Photography © Mildred Budny. 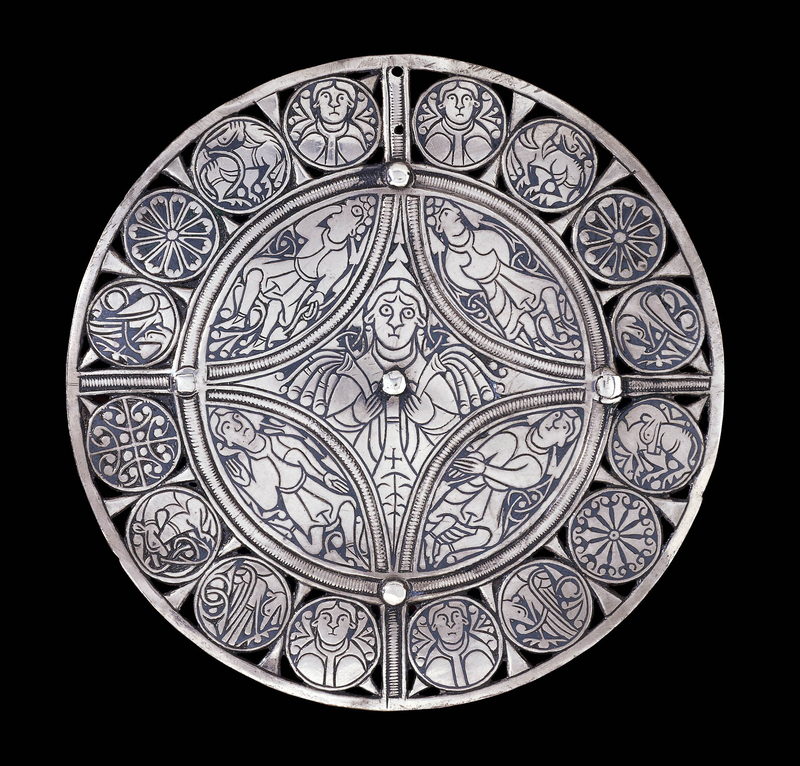 The 9th-Century Fuller Brooch. 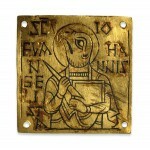 © Trustees of the British Museum. Not forgetting the splendor of the somewhat earlier jewelry and ornamental work of the Sutton Hoo Ship-Burial. 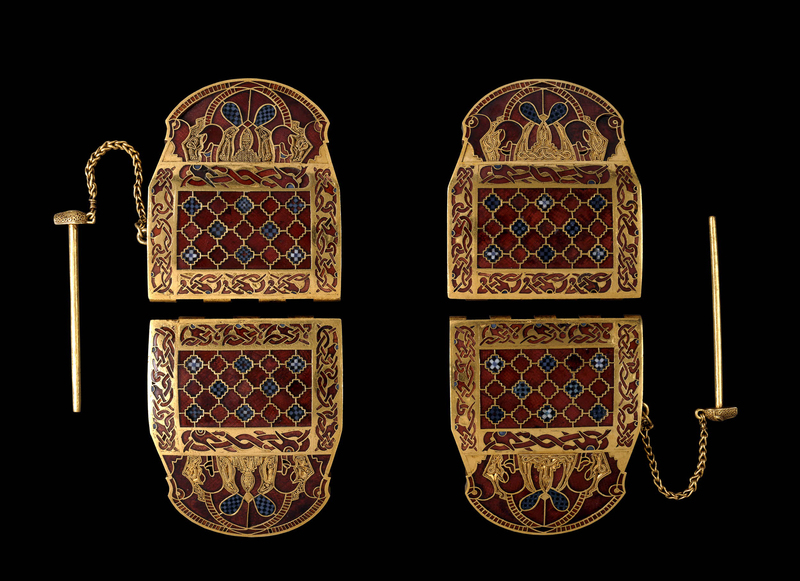 Pair of Shoulder-Clasps from Sutton Hoo. © Trustees of the British Museum. 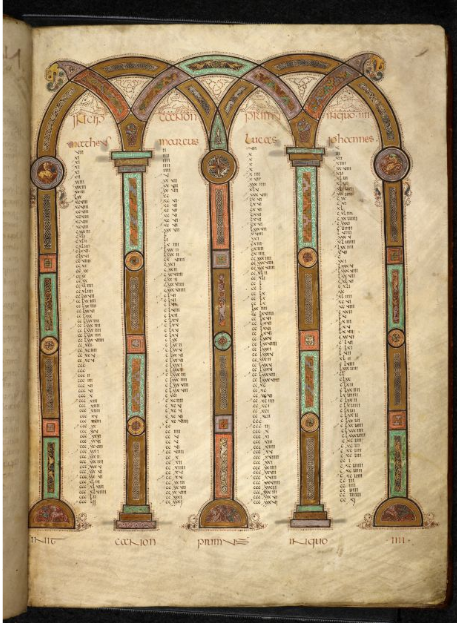 Magnificent Portals to Manuscript Studies stand at several points in the 9th-century Bible Fragment in Latin. They loom large, for example, in the arcades enclosing a majestic series of lists of Gospel concordances and enclosing the opening words of the Gospel of Luke: Quoniam quidem. The text and images there are rendered rather difficult to decipher because of the oxidation, darkening, and spread of the silver (yes, it really is silver) pigment upon the richly purple-dyed vellum leaf. Visiting the manuscript in the Manuscripts Reading Room at the British Museum (before the birth of the British Library as an entity), it was Love at First Sight. 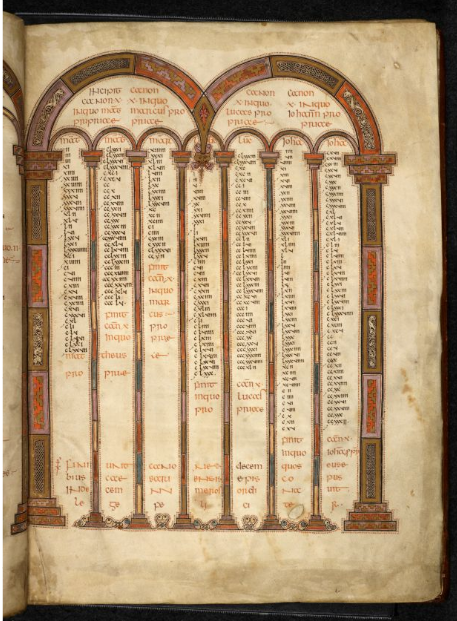 The renowned 8th-century Psalter (Bibliothèques d’Amiens Métropole, MS 18) is set out for consultation on the Same Reading Table with some of the lively, illustrated exploits of the intrepid and indomitable Gaul. Is that a Moment or What? © The British Library Board. 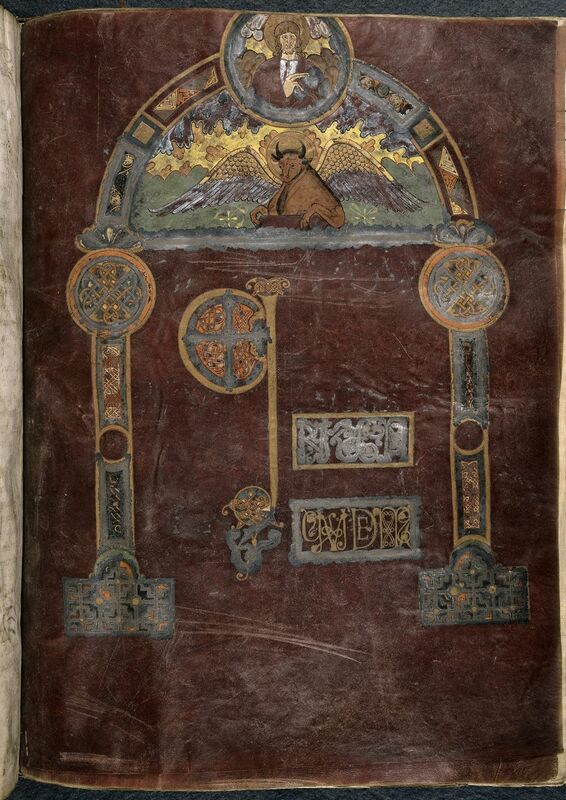 Additional MS 10546, folio 5r. © The British Library Board. 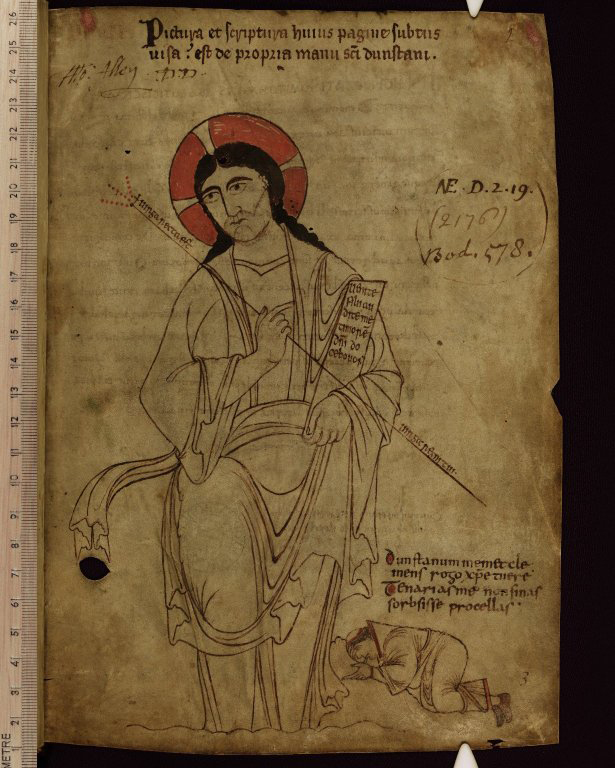 Additional MS 10546, folio 2r. © The British Library Board. 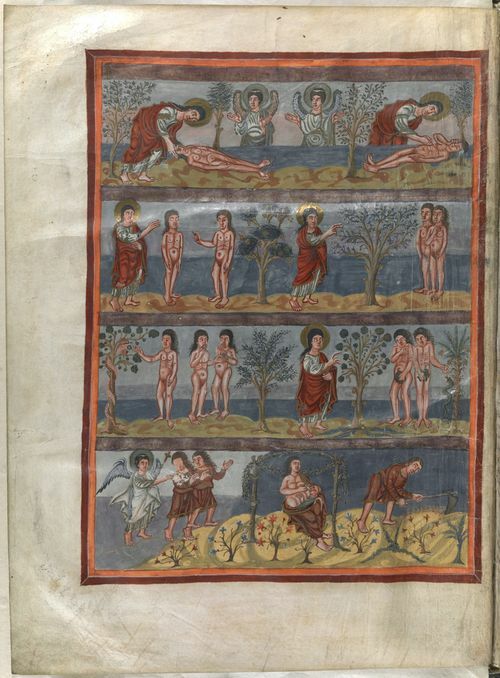 Cotton MS Nero D IV, folio 137v. The Lindisfarne Gospels: The Evangelist Luke as Scribe. © The British Library Board. 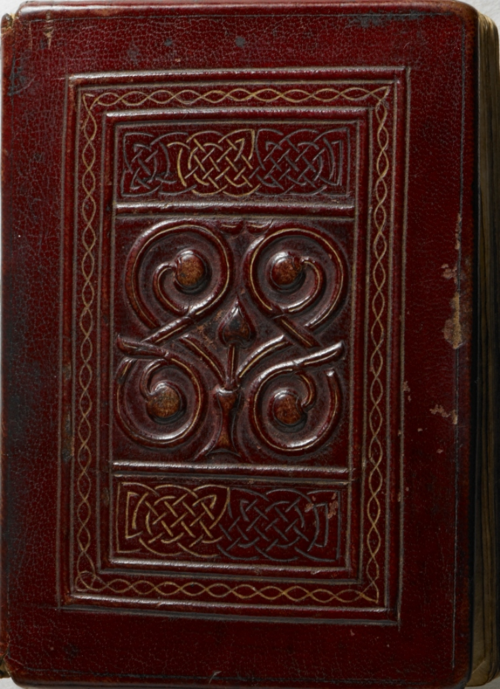 Cotton MS Nero D IV, folio 139r. The Lindisfarne Gospels: Opening of the Luke Gospel. © The British Library Board. Additional MS 89000, front cover. 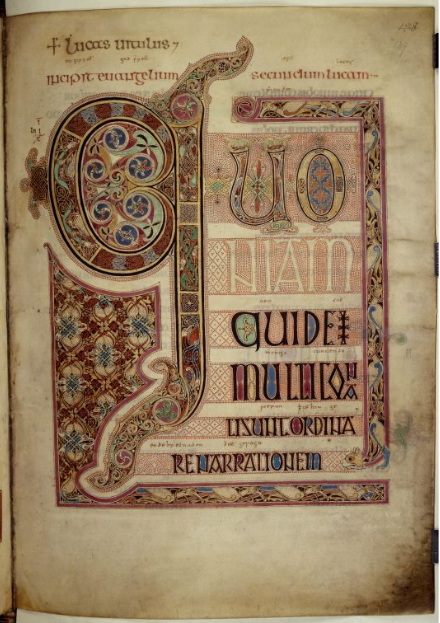 The Cuthbert Gospel of Saint John. One of my recent papers, about Parchment Versus Paper, for a Research Group Session, tells about those considerations which the sense of touch upon the pages may reveal or refresh. 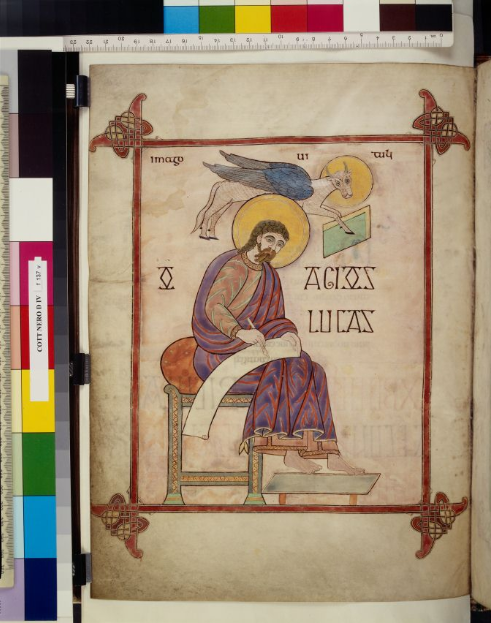 Our Reports of the First Series of Seminars and Workshops on “The Evidence of Manuscripts” describe these mentioned manuscripts, some of their challenges, the collaborative explorations, and the shared experiences in encountering them. Jane Rosenthal joined this workshop, devoted to an illustrated Anglo-Saxon manuscript of the poetic works of the late-antique poet Prudentius. Her experience of the workshop inspired the first of the series of Symposia organized by the Research Group on Manuscript Evidence following the move of its principal base to the United States in 1994. 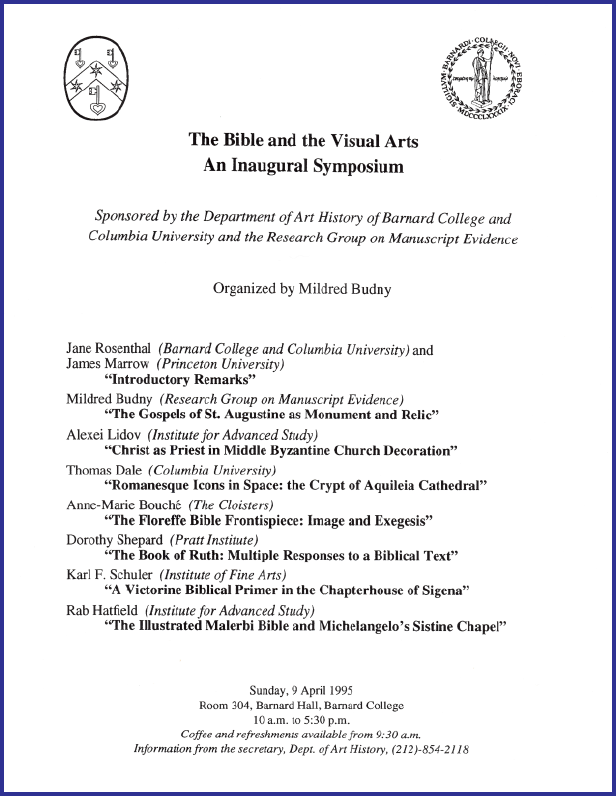 This first Symposium, held at Barnard College and Columbia University at Jane’s invitation, considered “The Bible and the Visual Arts”. After that series of Annual Symposia, there followed The New Series of Seminars, Workshops, Colloquia, and Symposia, still ongoing — thanks to various hosts, sponsors, contributors, and participants. This large-format copy of the Old English Bede, with miscellaneous texts added in the margins, was given by Bishop Leofric to his Exeter Cathedral. As the workshop considering the manuscript before our very eyes, with experts’ presentations on some of its many aspects spanning different fields of study unfolded, our gathered specialists came to think of it not individually as “My Manuscript” but collectively as “Our Manuscript”. The report of this workshop now, as I returned from Tom’s interview to survey the Research Group Archives for the official website, has an affectionate recollection of Julia McGrew’s class on Old English at Vassar, and the first introduction then to Archbishop Wulfstan‘s vigorous Sermon of the Wulf to the English — one of the texts which can be seen “in the flesh” in MS 201. “These Fingers Have Turned These Pages”. An important component of the research, encountering the original written (and illustrated) sources directly, in the way — or some of the ways — that books are intended, namely face to face and from page to page. One of the principles of a Vassar education, as our teachers said often. With hindsight, and with acknowledgments also to other teachers and models (academic and other, living and long dead, as glimpsed through the traces of previous generations), it can be observed that such principles helped collectively to ground the formation, development, activities, and mission of the Research Group on Manuscript Evidence. There is a quiet pleasure in having the opportunity to articulate some of those stages on a fine day this Spring in the Radio Studio at Main Building, a building where some of those processes have played their ongoing course. 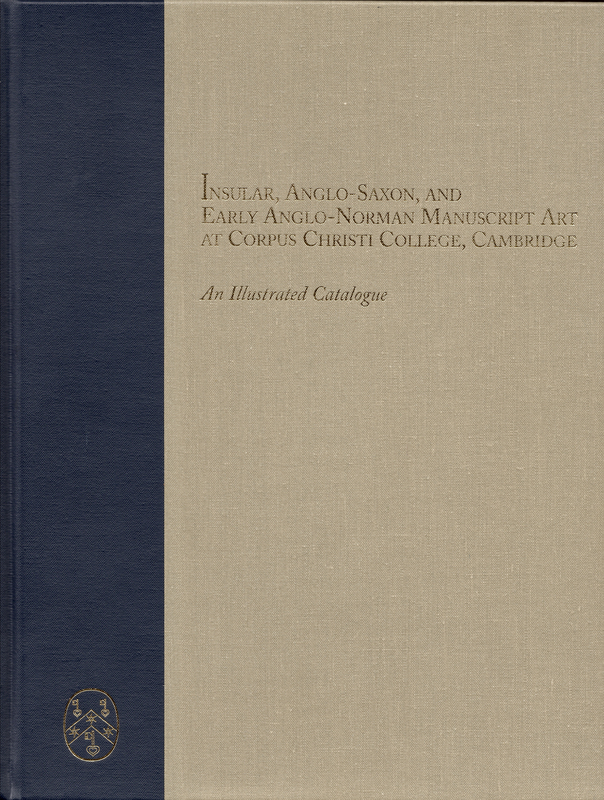 Tom’s radio interview asks also about the 2-volume Illustrated Catalogue of Insular, Anglo-Saxon, and Early Anglo-Norman Manuscript Art at Corpus Christi College, Cambridge, co-published by Medieval Institute Publications in association with the Research Group on Manuscript Evidence, Corpus Christi College, Cambridge. Its contents and character are described in some detail here. Now that the distribution has passed this year to the Research Group, we can present a special Promotional Offer. 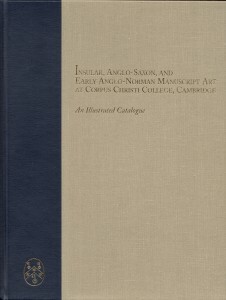 Because of special circumstances (described in the Report of the 1992 International Congress on Medieval Studies), the publication emerged as a form of photographic access to images of illustrations in early medieval manuscripts of the British Isles belonging to one exclusive collection, the Parker Library, where our research project was located. The aim for such access was related to Thomas Ohlgren’s long-term iconographic project (“CORPUS”) surveying the survivors as a whole in many collections. 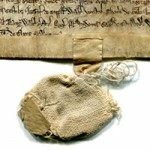 As work on the specific publication began, and the candidates for inclusion could be examined, more elements in the Corpus Christi College collection than expected from earlier reports emerged into light. 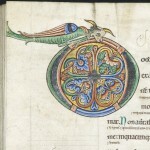 Responding to the responsibility, a redefinition of “Manuscript Art” beyond the confines of illustration and major decoration allowed for more materials to take their place, yielding a “Catalogue of Manuscripts at Corpus Christi College with Insular, Anglo-Saxon, and Early Anglo-Norman Illustrations, Decoration, and Artists’ Sketches”. 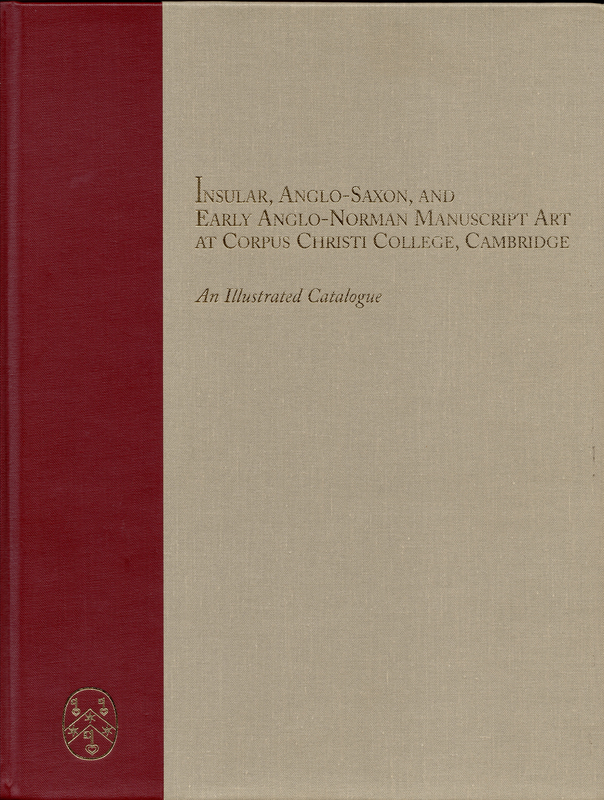 The catalogue, devoted to 56 manuscripts and manuscript fragments, is illustrated by 747 pages of black-and-white plates, a section of 16 pages of color plates, and 2 color frontispieces (all photographed by Mildred Budny for the purpose). 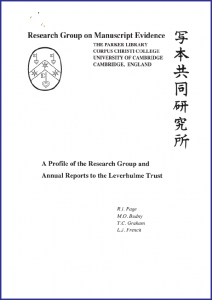 The detailed catalogue incorporates the fruits of long-term research. 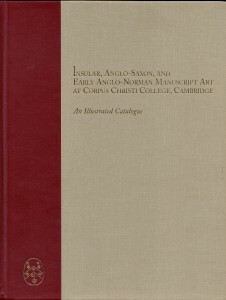 It is accompanied by a substantial introduction, which articulates “The Scope and Structure of the Catalogue”. To say that the length of the text, its different forms of textual elements or components, and the size of the volumes posed a challenge for design and type-setting is probably to state the obvious. 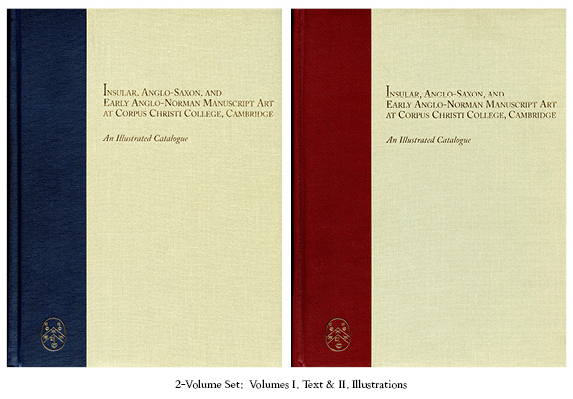 The design and layout of the volumes (apart from the covers) was the work of the Research Group on Manuscript Evidence, which delivered the camera-ready copy for printing and publication. You might like to read about some of the choices in layout and design which we could make for it — note that, among other things, we decided that we could and should make them — in our newly published Interview with our Font & Layout Designer. This landmark publication in our history prepared the way, and provided invaluable experience, for the Publications in various forms which have continued to flow from our designs. The Research Group’s Style Manifesto sets the standards. The Interview with our Font & Layout Designer tells some of the how, and how come. 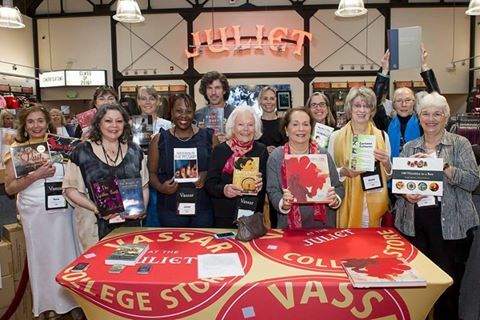 The Vassar Class Reunion in May 2016 also gave the occasion to join some other Vassar Alumnae/Alumni Authors at the Vassar College Store — now at the site of the Juliet Cinema of former years — for the chance to Meet & Greet the Alum Authors. The gathering, with some table space and refreshments, gave us the chance to meet each other, to show and to show off our books, and to meet new readers and, it may be, fans. A post on the Store’s own FaceBook Page soon afterward celebrates the occasion, with a happy Group Portrait to record the event welcoming its Alum Authors for the 2016 Reunion. Happy to be there. Interesting authors, glad to be among them. By the way, can you spot the biggest book? P.S. In this context, Size Counts. For the invitation to join this Reunion for Alum Authors and Classmates, and for the excellent arrangements for setting up, accomplishing, and packing up the display, I warmly thank Steve Glasgow, College Store Manager, and Sarah Tredwell, responsible for the logistics. Another bonus. The photographer for that occasion, as well as for the Reunion overall: a delight to meet. We got to talking, we talked some more, she now has her own signed copy of the catalogue, and we each find new friends. 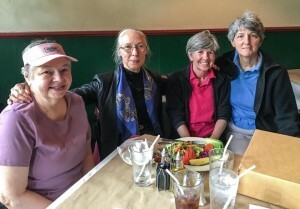 Here is a photograph of a gathering of new “group” of friends as we sat together in a nearby restaurant after the Reunion itself had completed, on a warm and sunny afternoon. The Reunion Photographer, a true professional, is another Vassar Alum, by the way. From a different class, not in the same 5-year rounds as my Class. So it took a special, fortuitous occasion to meet. One of my own classmates joins the group, as does an alum from another local college. I call this picture “The Four Graces”. Good Things can sometimes happen when Books make connections between People. Mutual Fan Club. At the 2016 Vassar Reunion, celebrating Alumnae of Vassar (different classes) and Marist College. Celebrating this development, and presenting a special Promotional Offer, we admire its opportunities of finding Foster Homes and Forever Homes for our Illustrated Catalogue, our largest publication and co-publication so far. Book-Signings and a Talk Show-and-Tell can be fun. It is inspiring to meet the readers, and to learn about their own interests. Keeps the communication flowing both ways. And so, the invitation to join the Meeting & Greeting event for Alum Authors at the Vassar College Store serendipitiously offered our Author & Director the chance to bring a written and illustrated testimony to sustained and dedicated immersion in the original sources — in the form of those 2 volumes, moreover, in multiple copies — “back” to one of the very centers of education, that is, Vassar and the people involved in it in various ways, which helped so fundamentally to begin to train, incline, and foster the directions of the research. Also, the invitation to visit Tom’s Library Café and to join its cast of Speakers has spurred constructive reflections upon the course of the work so far, its inspirations, its choices, its aims, its products, and its outlook. Although the path has not been straightforward, and the world — as well as the academic world — has changed forcibly along the way, it seems remarkable that dedication, perseverance, and resourcefulness (as well as a love of the subject, or some parts of it) have made it possible to continue to sustain research and its publication, within an institutional framework in the form of a nonprofit educational corporation with no fixed abode and little financial support, but much goodwill. Where there’s good will, there may be a way forward. Who’d have guessed where the steps would lead? On graduation day from Vassar College, if anyone had predicted that this earnest scholar would have become the founder and director of a new educational institution (albeit without walls and staff), it might have been difficult to believe — not least because it would have been difficult, to say the least, accurately to predict the ways in which the future of the educational worlds would change. The point was not to start some new organization. Others might begin, continue, and complete their quests in such ways. Having substantial funding can aid, or oil, that process significantly. Not here. The point was principally to find some way to prepare, and if possible to sustain, an umbrella, refuge, credibility, letterhead, and set of activities for some dedicated scholars, independent scholars, and others (established scholars included). Not everyone finds it useful or even distantly worthwhile, and some of them find it ridiculous or beneath disdain. It is not designed to fix the world, but to find some brief “Foundling Hospital” for the kind-hearted and the wondering wanderers to meet. A Means to Amend. The Group seeks to examine, record, and analyze the evidence of these [or any] witnesses of history, life, thought, art, and culture, and to set their testimony in context. . . . It offers a concerted, informed response to the complex challenges of preserving, transmitting, and understanding the legacy of the past. By such means we seek better to understand the present and to help prepare for the future, above all a future worth having. You can listen to the Interview at The Library Cafe, starting with its live broadcast on Wednesday, 12 October 2016. Within 75 miles of Poughkeepsie, you can tune in to WVKR FM 91.3 on Wednesday afternoon between 12:00 Noon and 1:00 p.m. ET (17.00-18.00 GMT). Beyond that range, you can listen live on the web by clicking the “Listen Live” link by the radio icon in the right column of the blog. Thomas Hill in the Radio Studio, May 2016.